It is a rare long weekend for me. I am wrapping up one work from home project and am already prepped for my next teach which isn't for another week. So I have resumed my battle with the basement where I try very hard to stick to the "you haven't thought about it in over 5 years, toss it out" rule. Of course it isn't working. Instead I just head down memory lane. This morning I tackled a box that appears to be one of the last ones packed the last time I moved. A collection of things to sort out later. One pile was all papers. Some were worth keeping at the time such as a receipt from a work trip not old enough (when I moved) to be out of audit range. Others are a mystery like boarding passes with no particular meaning. Some are no longer readable. Then there are the more meaningful tickets to keep like the entry to the Empire State building Observatory. I get why I might have kept it at the time. Sort of. I used to do some scrap-booking but even then, this particular ticket is just a been there done that memory. It was in the evening, after class, by myself. Not a Sleepless in Seattle moment in any way. Another brought up memories of a planes, trains, and automobiles trip in a blizzard. That trip also introduced me to a really cool coworker. With a storm shutting down the Northeast when we both had classes scheduled, the company we were contracting for at the time rearranged our travel. 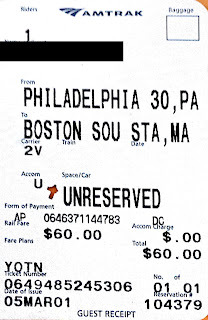 then met at the Amtrak station in the city to catch a train to Boston. I know Boston well and if I had not been with a traveling companion, I would never have agreed to a planned arrival at South Station, at night, in a blizzard, with the need to get out to Burlington. Yet here I was, meeting a coworker for the first time at a train station in Philly to travel together the rest of the way. It was more like 1am when we got to South Station and my traveling companion managed to wrangle us a taxi over to the airport to pick up a rental car. My knowledge of the area got us to the hotel in Burlington as we passed under road signs indicating all but emergency personnel should stay off the roads. We called the hotel on the way to make sure they stayed awake to let us in which was good since they had about given up on our arrival. Just to add to the excitement, when we got up in the morning to teach our respective classes, the car had a flat tire. The hotel shuttle took us to the training facility and the show continued. I don't remember how many of our students actually made it but since some were from out of town and also in our hotel, I know there were some. 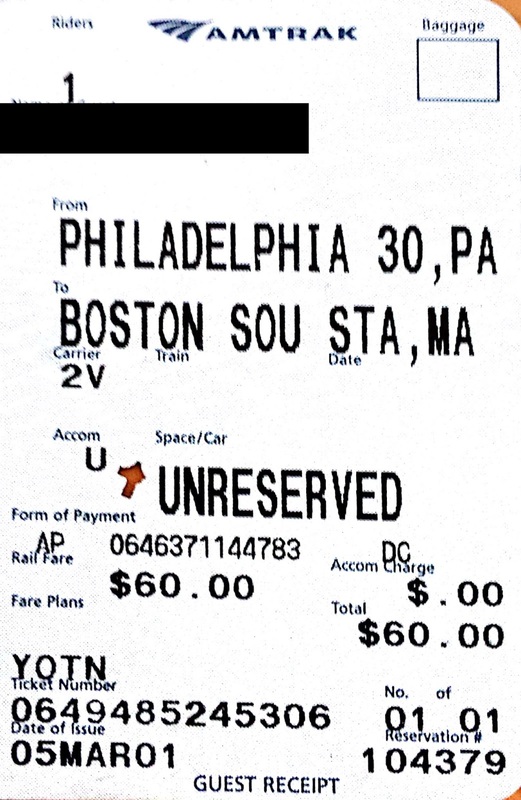 These tickets are now nicely preserved in the wonderful world of the Internet. A few less pieces of paper cluttering my basement.